Practical presentations on the new improved Aquabox service available for your club NOW! Aquabox was launched as a charity in October 1992 by the Rotary Club of Wirksworth in Derbyshire, since when well over 100,000 boxes have been shipped overseas equating to the provision of an estimated 482 million litres of purified water. Although an established and successful box scheme well known to many Rotarians, 2011 was a watershed for the charity as technological advancements and logistical changes enabled significant improvements to be implemented. Boxes come in two sizes - are packed by volunteers in the Wirksworth warehouse. Every Aquabox now contains an Aquafilter Family, replacing the previous chlorine tablets and carbon filters, to give a longer lasting solution. For latest news, subscribe to the Aquabox Newsletter here. Rotarians David Sutherland and Andrew Fairbairn are available to provide practical presentations throughout District 1090, updating members on the current situation. 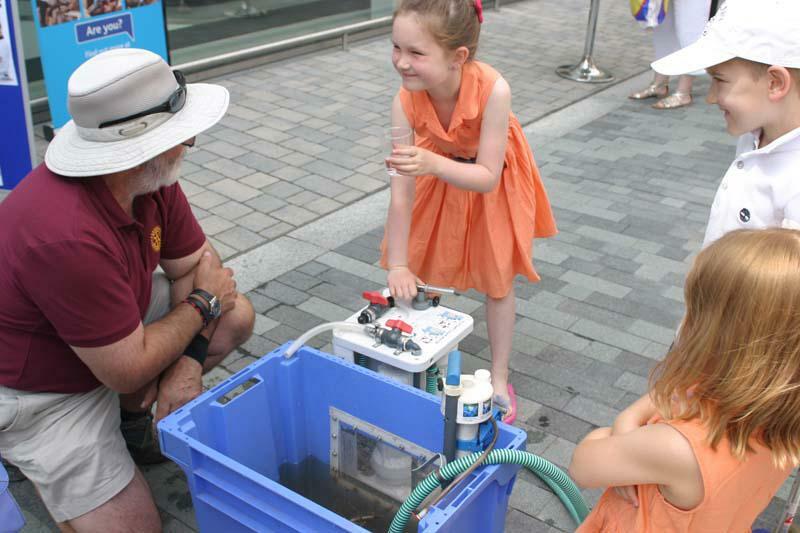 Aquafilter equipment is also available for use at Rotary events and is a popular way of attracting the crowds. Thanks to Dorothy Dix for the video. PS Greg is very much alive and well and got married two weeks later!